Does anyone here use Mach 4? Any pros and cons to what comes stock from Inventables? I was thinking of getting it and was hoping for a impartial review. Thanks. Mach3 or 4 will not run the stock x-carve electronics. That being said, I used Mach3 on my system, but I switched to the Gecko G540 controller. Works great. Mach3 or 4 will not run the stock x-carve electronics. Well that is sad to hear. 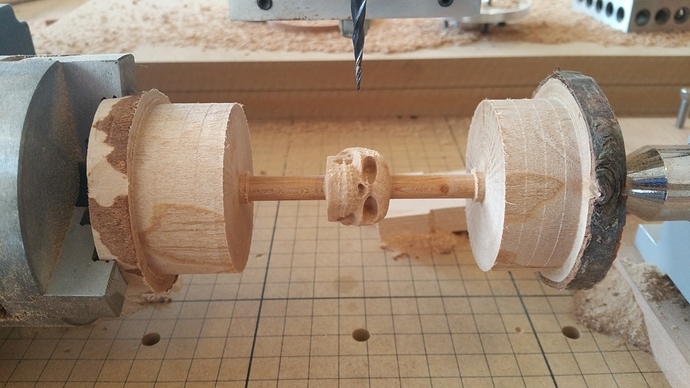 I wanted to use a pendant with the X-Carve and was told to use Mach 3 or 4. Do you know if a pendant can be used with Gecko? The standard electronics for the X-Carve run grbl. I swapped out the electronics and went with the Gecko G540 and a G251 to control my system, so any mach 3 compatible pendant will work with the Gecko electronics. Just to be clear, when you say "standard electronics" you are talking about the X-Controller correct? I was looking at the Gecko website and really like what I see there. I am probably going to go with a water cooled spindle and I think the Gecko electronics will match up nicely with the VFD. Thank you for showing me the Gecko electronics. X-Controller or the Arudino G-Shield combo...both use grbl (both standard for the x-carve...the X-Controller is newer). Thanks Erik. Appreciate the help. I've been looking at the Gecko electronics and really like G540. I'll probably be buying one like you did, but I was wondering why you also have the G251. Do you have two X-Carves, or somehow using both on one machine? The Gecko G540 controls 4 stepper motors, 2 on Y-Axis, 1 on X-Axis and 1 on Z-Axis. I added the G251 to control a fifth stepper motor that runs my rotary axis. Over the past 15 years I have had several occasions to return Gecko divers (some out of warranty that I probably damaged by my bad wiring) back to Gecko for repair, and I never was charged for any repairs, or return shipping. Gecko customer service is unequaled in the hobby cnc world. I never was charged for any repairs, or return shipping. What computer are you running it on? An older 32bit OS and the MB has a parallel port or do you use a parallel port card? I am running it on a fairly new system, windows 10, 64 bit. I do not have a parallel port so I am running the ethernet smoothstepper and connect with an RJ45 (ethernet) connection. I think I'm going to go with a G540, Super-PID and Mach 3. Funny thing is we had a real old computer upstairs in a spare bedroom I was about to just throw in the trash. Today after work I walked up there to look at it. Windows XP, Pentium 4 2 GHZ, 1 GB ram, Geforce 6800 with 256 MB ram and the MB has a parallel port. Perfect to just run a CNC. So now I'm cleaning all the junk out of it and then defrag the HDD. I had my heart set on getting a Super-PID, but then I read on this forum somewhere that for slightly more I could get a water cooled spindle which would have many added advantages. I have a CO2 laser that has to be water cooled. I have a setup with a water tank then it goes through an aquarium water chiller then through the laser tube. It works great but it's upstairs in the house. I looked at those spindles but I'm going to put the xcarve in the garage / wood shop and it get's below freezing here. The garage is insulated and I do have a natural gas heater in there but I don't want to run it all the time just to keep my spindle from freezing. If I lived in a warmer climate, I would go with the water cooled spindle also. I am running it on a fairly new system, windows 10, 64 bit. 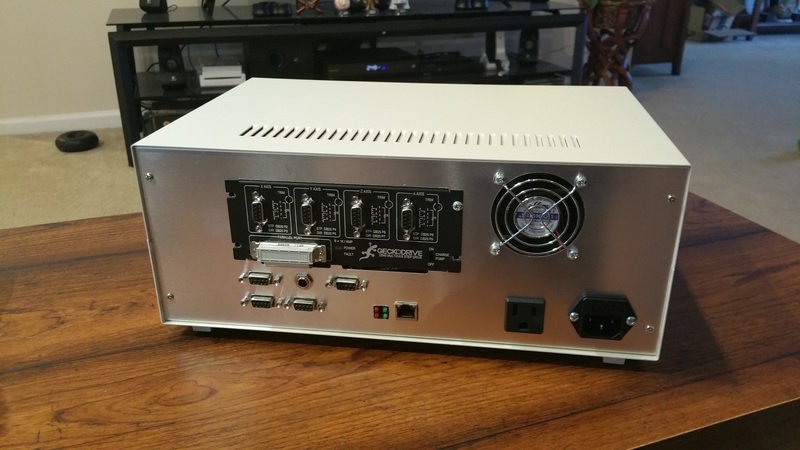 Erik do you have your G540 in an enclosure? I was reading about how hot the drivers can get. Wondering about which heat sink is best to use. I have no additional heat sink, just the one small fan in the case. I have not had any issues with heat. Where did you get your case?